In the first comprehensive redesign of its domestic onboard service product in more than a decade, Hawaiian Airlines has cemented its signature ‘Mea Ho‘okipa Service’ as the gold standard in domestic air travel and the only authentic Hawaii experience in air travel. Hawaiian’s ‘Mea Ho‘okipa’ (translation: I am host) inflight service philosophy has long been embraced by travelers for its celebration of the culture, people and Aloha Spirit of Hawaii. Reintroduced August 1 on all flights between Hawaii and its 11 gateway cities in North America, Hawaiian has taken its acclaimed inflight service and made it even more enjoyable with enticing new made-in-Hawaii products, Island-style complimentary meals and improved service offerings. The new program was inspired by customer feedback, solicited by Hawaiian to further align its service with the things that customers value most in onboard service and amenities. With its new inflight hospitality program, Hawaiian is restoring a little elegance to onboard dining. “We’re bringing back the ‘good old days of flying’ by making inflight dining a pleasant part of the travel experience, while showcasing the products and promoting the ambiance that makes Hawaii so special,” said Blaine Miyasato, Hawaiian’s vice president of product development. Hawaiian is continuing to offer complimentary full meals at mealtimes to all customers on its North America flights – as any island family would do for their guests in their home – and its new menus designed by Executive Chef Chai Chaowasaree highlight the foods and flavors of the islands. Hawaiian remains the only US carrier serving Hawaii that offers complimentary meals in all cabins. For example, Hawaiian’s new breakfast menu for morning departures features Hawaiian Sweetbread with Cream Cheese and Guava Jelly, Tanioka’s Dried Mango, Papaya and Pineapple slices and a Macadamia Nut cookie. The new lunch menu for afternoon departures features entrees of Ginger Chili or Teriyaki Chicken with Steamed Rice and Savory Vegetables and dessert of Mango Cake or Kona Coffee Cake with Dark Roasted Coffee Bean. Also new to Hawaiian’s meal service in the Main Cabin is a complimentary glass of red or white wine with lunch or dinner. Hawaiian’s wines are personally selected by Hawaii Master Sommelier Chuck Furuya. Another new feature of Hawaiian’s complimentary service is the offering of a new signature tropical cocktail featuring Koloa Rum from Kaua‘i and an island-style snack, such as Maui Style Potato Chips, served two hours before landing to put travelers in an ‘island’ frame of mind before arriving, or to leave them with a final flavor of Hawaii before returning home. In addition to its complimentary meals, Hawaiian’s premium meals for purchase in the Main Cabin now feature delicious new selections designed by Chef Chai that reflect the diversity of cultures and flavors that now characterize local cuisine in Hawaii. The complete meals feature mouth-watering entrées like a Kalua Pork Sandwich, Island-Style Chicken, Prawns with Cold Noodles, and Chinese Chicken Salad, and are complemented with Maui Style Potato Chips and Hawaiian Spring bottled water. Guests can also enjoy a complimentary glass of wine with their premium selection. Also new to its onboard service, the Pau Hana Snack Bar is an extension of Hawaiian’s friendly galley service, where guests stop by to have drinks refilled, purchase island-style snacks like spam musubi or ramen noodles. Also available for purchase at the Pau Hana Snack Bar are fresh flower lei on flights to North America and Hawaiian Airlines branded gift items. 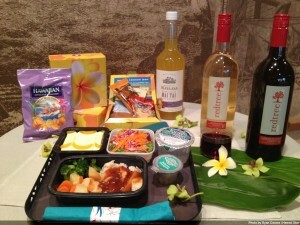 A highlight of Hawaiian’s new service is the showcasing of Hawaii products in its premium meal and snack offerings. Products like Primo Popcorn’s Wasabi Ranch or Li Hing Pineapple flavored popcorn, Kona Chips with Furikake Seasoning, Guava Macadamia Kaua‘i Kookies, Tanioka’s Li Hing Mango Slices and Hawaiian Host Chocolate Covered Macadamia Nuts are just some of the made-inHawaii treats that are offered for purchase at the Pau Hana Snack Bar. Hawaiian has also introduced the “Ho‘okipa Desk” in departure lounges, where guests can preorder inflight amenities such as premium meals, snacks or entertainment systems before they board their flight, get tips on what to do at their destination or learn more about their inflight experience. Onboard, Hawaiian has also redesigned the orchestration of its inflight service to allow for more interaction between flight attendants and guests. In addition, flight attendants are now assigned to certain rows, allowing them to focus on fewer guests than before and have more time to talk story and serve each guest in a manner more befitting the Hawaiian tradition of hospitality. Hawaiian has led all U.S. carriers in on-time performance for each of the past eight years (2004-2011) as reported by the U.S. Department of Transportation. Consumer surveys by Condé Nast Traveler, Travel + Leisure and Zagat have all ranked Hawaiian the highest of all domestic airlines serving Hawaii. Now in its 83rd year of continuous service, Hawaiian is Hawaii’s biggest and longest-serving airline, as well as the largest provider of passenger air service from its primary visitor markets on the U.S. mainland. Hawaiian offers nonstop service to Hawaii from more U.S. gateway cities (11) than any other airline, along with service from Japan, South Korea, the Philippines, Australia, American Samoa, and Tahiti. New nonstop service will begin between Honolulu and Sapporo, Japan (October 30, 2012), Brisbane, Australia (November 27, 2012), and Auckland, New Zealand (March 13, 2013). Hawaiian also provides approximately 170 daily jet flights between the Hawaiian Islands.